Should the United States privatize its social security system? Should Turkey be granted entry into the European Union? Should Israel dismantle some or all of the settlements it has built outside of the country’s 1967 borders? Those questions, and many more, are often the subject of polarizing debate. That’s especially true online; a sadly large number of people seem to think that anonymity and geographical distance afforded by the internet gives them free license to insult and spread vitriol. (We are constantly shocked how that’s true even on a non-partisan, non-political site like this one; imagine the comments we didn’t approve on our review of the best submarine movies). In Spot Cool Stuff’s view, there’s no problem in people having strongly held opinions. Believe that the death penalty is immoral if you think that’s right. Maintain that the death penalty is justified in some circumstances if you are so inclined. But whatever your view and however strong your certainty you are “right” remember that there’s an argument on the other side. And that the people who hold views opposite to yours have their logical, justifiable reasons for doing so. That’s where Debatepedia comes in. The website covers a whole range of social, political and entertainment issues—from the legalization of gay marriage to the EU’s bailout of the Greek government to the wisdom of instant replay in baseball—but is completely agnostic on all of them. 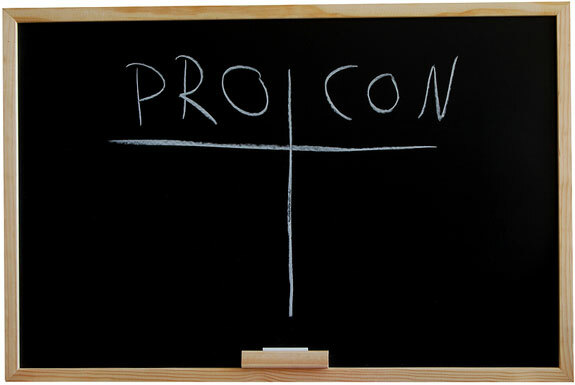 Instead, Debatepedia presents the pros and cons of each side. It’s a Wikipedia of debates, if you will. What’s especially great about the site is that it isn’t just a bunch of links. Every debate topic starts with an informative summary. Topics are then broken down into smaller units. 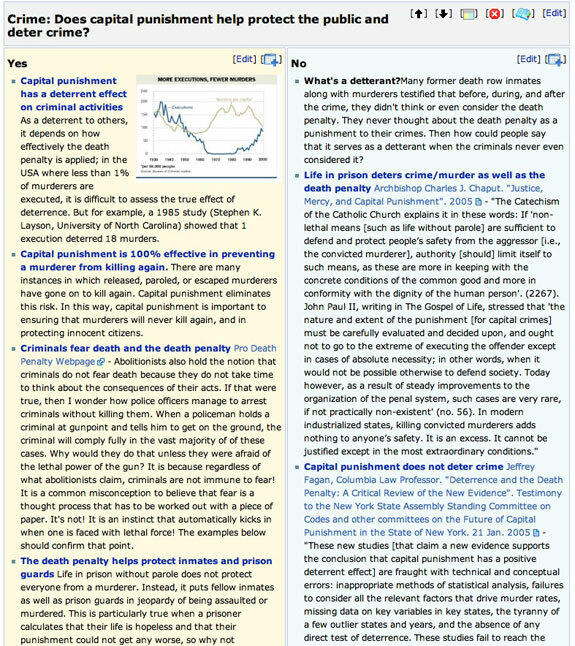 On the death penalty argument, for example, there’s a pro and con side to questions like “Is capital punishment good for the families of victims?” and “Does capital punishment help protect the public and deter crime?” On most topics the site also shows a variety of YouTube videos and suggests books for further reading. All that makes Debatepedia one useful and very cool website. On that there’s no debate.